We all know that TSM is a legit mag. They do it right, and we were pleasantly surprised to see that they Geek’d out on the new Broadcast Wheel Company line. 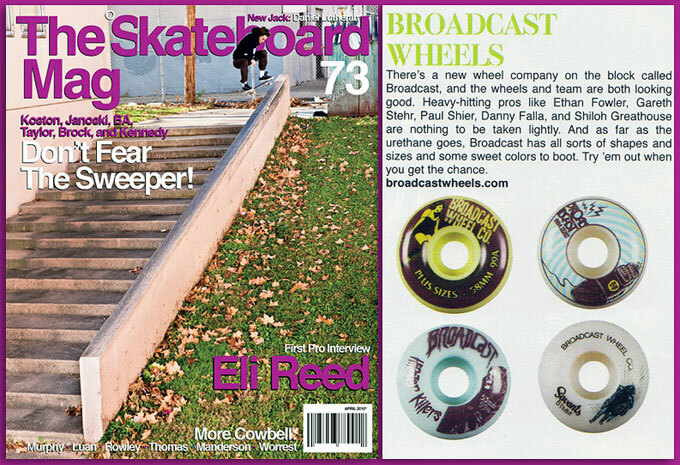 A biggy thanks goes out to the fine folks at The Skateboard Mag for noticing a little brand like Broadcast. “There’s a new wheel company on the block called Broadcast, and the wheels and team are both looking good. Heavy-hitting pros like Ethan Fowler, Gareth Stehr, Paul Shier, Danny Falla, and Shiloh Greathouse are nothing to be taken lightly. And as far as the urethane goes, Broadcast has all sorts of shapes and sizes and some sweet colors to boot. Try ’em out when you get the chance.” – The Skateboard Mag. Go to your local skate shop, pick up a copy of Issue 73 and enjoy.